Lizl joins FCBT with over 6 years’ experience within Flight Centre South Africa. 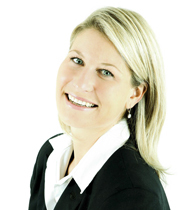 Lizl began her career with Flight Centre as a consultant at the Paarl location. After just 2 years, she was promoted to Team Leader and continued to manage Paarl for another 3 years before moving over to Travel Associates. While working as a consultant and team leader, she gained considerable experience with a wide range of businesses in a number of industries including those in marketing and advertising, law, finance, export, education and the wine industry. Lizl enjoys the variety that working in the travel industry brings as well as organizing off the beaten path travels. Travel Tip: To avoid hassles, Lizl recommends that her clients check their names on any travel documents to ensure they are spelt as per their passports and to make sure they have the right inoculations.